This is a follow-up to the Leftovers Scramble I posted not too long ago. While the results are undoubtedly delicious when you fry chili and scramble eggs into it, the final product may not always look so appetizing. This updated version is a little more refined, even suitable for serving guests while still making use of your leftovers. Set the egg mixture aside and turn your attention to the salmon. 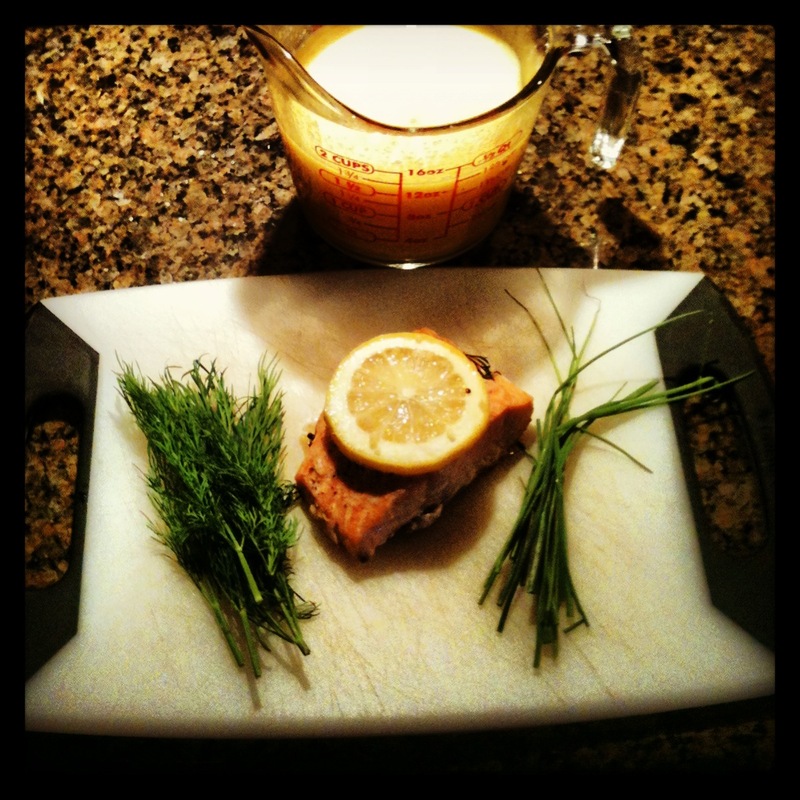 Discard any of the garnishes that may remain (the lemon, the dill that was cooked with the fish), but retain any garlic that may still be present. Flake the fish into small pieces gently with a fork. In addition, finely chop the fresh chives and set aside. 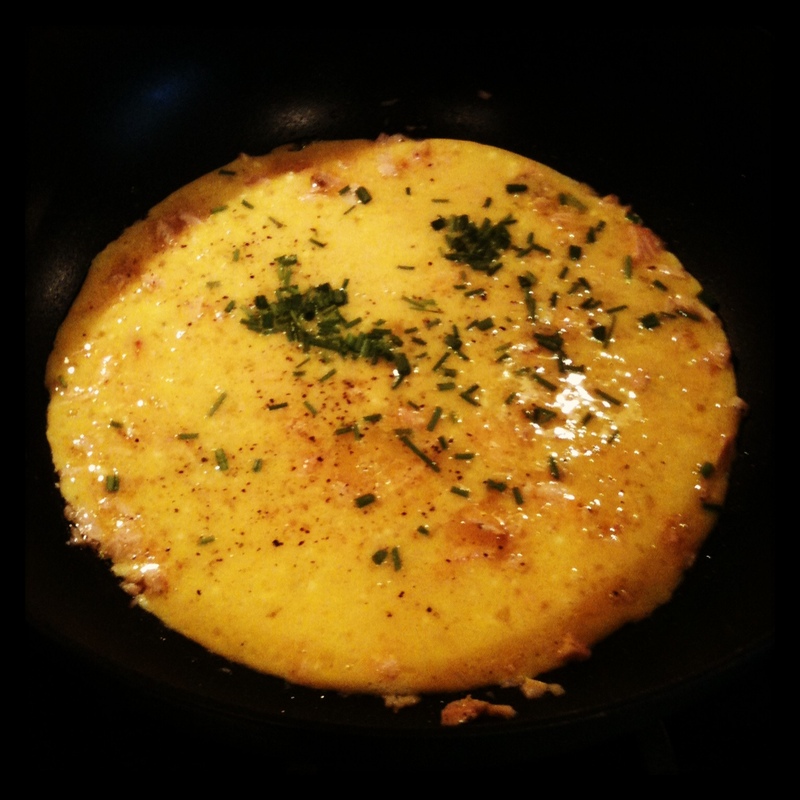 In a non-stick pan or skillet, heat a little olive oil (or butter, your choice). Add the fish and cook for a few minutes until well heated. If you like, you can crisp the edges of the fish a little as well, but be careful not to overcook the salmon. Pour the egg mixture over the fish and season with salt, pepper and the chives. Cook in the pan, stirring frequently to keep the ingredients evenly distributed. Just before the eggs are completely cooked, pinch off several of the dill leaves and add to the pan. Stir a few more times to distribute the fresh dill. Transfer each serving to a plate and garnish with more fresh dill. Serve with some fresh fruit, toast or even some roasted potatoes. Pour yourself some coffee or juice, a bloody mary or a mimosa, and…Enjoy! 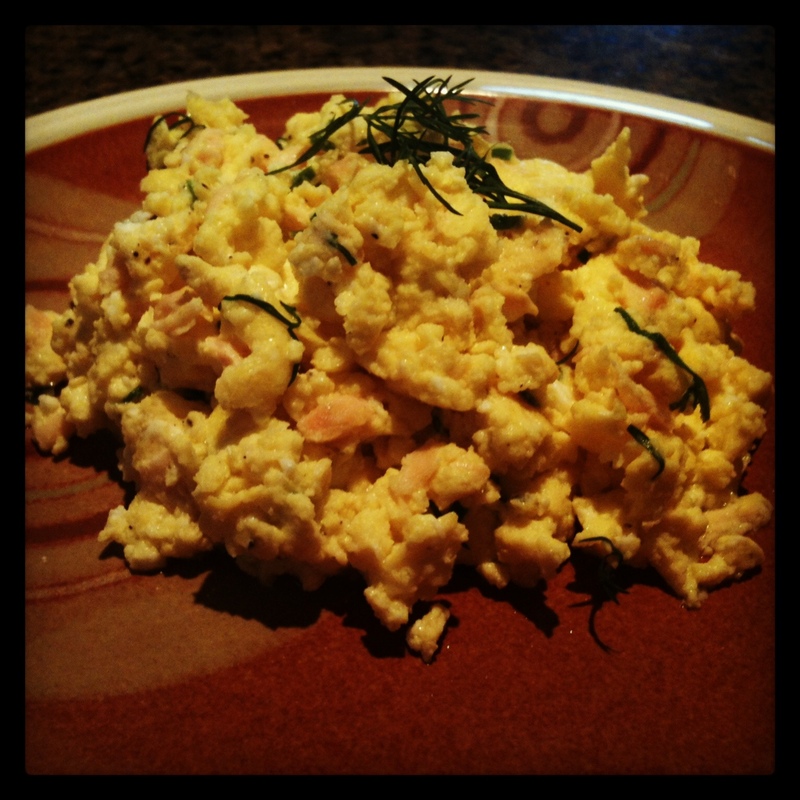 Lovely combination there – dill is made for eggs and salmon. Perfect Sunday morning brunch for me!